April 14th, 2019. Rewrite your PB on Tamaki Drive. The event base is Selwyn Domain, right in the heart of Mission Bay. The race starts on Tamaki Drive, heading first to Mechanics Bay with the city skyline as a sighter before heading back along the stunning waterfront ribbon towards St Heliers. Finishers will feel the spray from the iconic Mission Bay fountain as they cross the line, earning themselves a beautiful commemorative finisher medal and … probably … a new PB. And if you’re not quite up to the half marathon just yet, there’s still the 10K Classic, 5K Fun Run & Walk or 2K Kids’ Dash to aim for. Yep, you guys get a medal too! The Waterfront Half Marathon aims to be the most spectator friendly event in the country. Those taking on the 21K will pass the race site three times on their way to the finish line, so there’s no shortage of opportunities for cheers and encouragement. Meanwhile, whilst you are on the road, they can enjoy Mission Bay’s cafes, beach and play area without missing any of the action. The inaugural event was a belter; stunning weather, fabulous on-course entertainment and a party atmosphere at the finish line. 2019 promises to be even better … we hope you can join us. Enjoy a genuine “big event” feel as thousands of runners reclaim the steets for the third largest running event in Auckland! Please be aware there is no in-person late entry available on race day. However, you can register online and pay by credit card on race morning. Just follow the normal Enter Now button below. You can even do it on your phone at the venue if you wish. However, it is your responsibility to allow enough time to collect your race number from the Registration tent prior to your event start. Note that race day entries come at additional cost to the prices shown here. PLEASE NOTE: The Kids Dash race is now SOLD OUT. A comprehensive guide to the Waterfront Half Marathon. Please be aware there is no in-person late entry available on race day. However, you can register online and pay by credit card on race morning. Just follow the normal Enter Now button on this web site. You can even do it on your phone at the venue if you wish. However, it is your responsibility to allow enough time to collect your race number from the Registration tent prior to your event start. Note that race day entries come at additional cost to the prices shown here. All shuttle bus tickets have now been sold for the 2019 event. If you are travelling on one of the services, please be sure to download your instructions PDF from the Shuttle Bus tab below. It is your responsibility to ensure you report to the your allocated bus, in the correct place at the correct time. A full passenger list for each bus is included with the instructions. Find your name, find your bus number, get ready to board! Onya! 16 Dec 2018 Super earlybird entry rates expire. 06 Feb 2019 Earlybird entry rates expire. 14 Mar 2019 Last opportunity to claim 50% refund for withdrawal. 17 Mar 2019 Last chance to claim free delivery of your race number. 07 Apr 2019 Family entry packages expire. 08 Apr 2019 Race Week entry rates apply. 13 Apr 2019 4-5pm: Pre-race registration at the event venue. 14 Apr 2019 Race Day! 7:15am Half Marathon: Safety briefing and warm up at the main stage. 8:45am 10k Classic: Safety briefing and warm up at the main stage. 9:15am 5k Fun Run & Walk: Safety briefing and warm up at the main stage. 9:45am 2k Kids’ Dash: Safety briefing and warm up at the main stage. The Waterfront Half Marathon event t-shirt is available to purchase when you register. Made from light-weight, dry-fit material, the shirt design features the Waterfront Half Marathon logo. You can order your t-shirt during the entry process or – if you change your mind later – add it to your registration order. You can pick it up from the Merchandise tent at the venue during pre-race registration or on race day. The t-shirt design will be available soon. 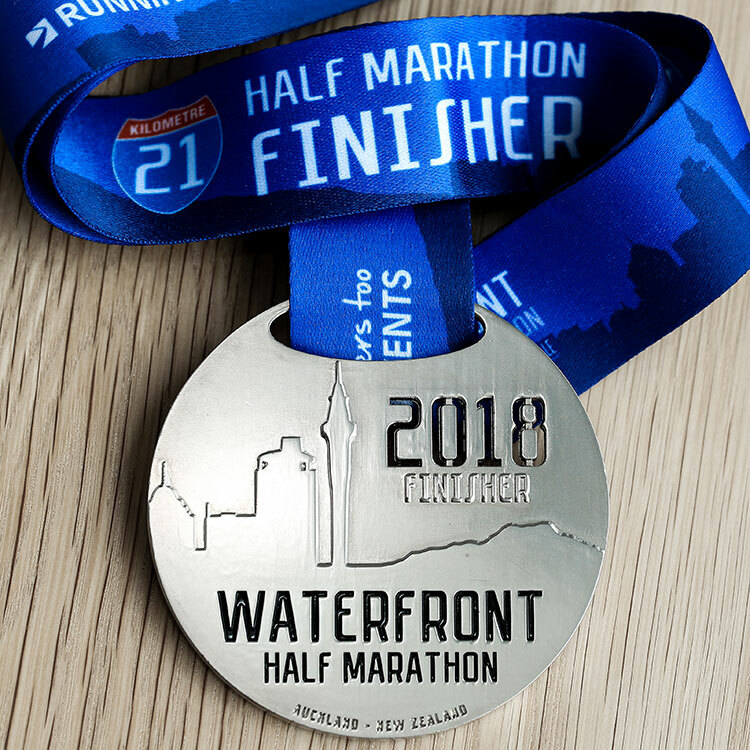 Everyone who finishes the Waterfront Half Marathon – irrespective of distance – will receive a stunning and exclusive commemorative Finisher Medal. The design for the 2019 medal will be revealed here closer to the event. You can see the 2018 medal below – everyone loved it! The medal features a colour-coded ribbon which is keyed to your event distance. So those finishing the half marathon had a blue ribbon, those in the 10k received a green ribbon, those in the 5k an orange ribbon and the kids dashers got a red one. Additionally, as this event is part of the Mizuno Auckland Half Marathon Series, all finishers in the half marathon distance will also receive an AHMS finisher token. Each person who earns all five tokens in a single season (meaning they have personally finished the 21km distance at Devonport, Omaha, Orewa, Coatesville and Waterfront Half Marathons) will receive an amazing Grand Slam mega-medal as a memento of your superb achievement. Each of your finisher tokens fits inside the Grand Slam medal to make the ultimate runner’s blingfest! Running Events, organisers of the Waterfront Half Marathon, are indebted to Auckland Council, Auckland Transport, Orakei Local Board and the residents and businesses of the beautiful eastern bays for their support for our event. In order for the event to take place safely, a full road closure of Tamaki Drive between Ngapipi Rd and Long Drive will be in place from 4am – 11am on race day. During this time – other than race and emergency services vehicles – absolutely no vehicles will be permitted access within the road closure. Cyclists – this means you too. Limited, single-file access to Orakei Marina and Kohimarama Yacht Club may be provided at the organiser’s sole discretion. Please check with the commodore for details. A contra-flow system will be in operation on the causeway section of Tamaki Drive – from Mechanics Bay to Ngapipi Rd – from 5am until 9am. During this time, vehicular traffic heading east and west will share the two lanes on the landward side of the road. The two lanes on the seaward side of the road will be reserved for runners. Drivers are encouraged to slow down and proceed with caution through the causeway section of Tamaki Drive during the event. 2019 Shuttle Bus Tickets have all now been sold. If you are on a shuttle bus, please ensure you download the information sheet for your bus below. Use the passenger list provided to find the bus number you have been allocated to. Your driver will check you off the list when you board. You can only board the specific bus you have been assigned to. Coaches will operate to/from Auckland City and to/from the North Shore (stopping at Albany and Smales Farm) for those who have PRE-PURCHASED a bus ticket. The early bus will arrive at the race site in plenty of time for the Half Marathon start and the later bus will cater for all other events. It’s important to register for the event and secure your bus tickets as early as possible as buses may fill closer to the event and additional services may not be possible. A return bus service will operate to return you to your pick up point. All buses will depart Mission Bay as soon as possible after the conclusion of the Awards Ceremony (approximately 11:30am). For those heading back to the city, earlier shuttle services will depart Mission Bay at 9:30am and 10:30am. Space on these services is provided on a first-come, first-served basis. The full timetable and details for the Bus Service is available in PDF format here. Important! This timetable is subject to change. Please check back during race week to confirm arrangements and locate the exact bus you have been allocated to. As this event is also the culmination of the eight-month long Mizuno Auckland Half Marathon Series, we will present awards to our series champions. The iTab is a self-adhesive metal plate which is delivered direct to your home approximately three weeks after yourevent with your name, distance and time engraved on it. It’s a wonderful way to celebrate and immortalise your achievement. Where possible, our finisher medals have a recess on the back to fit your iTab insert. You can purchase an iTab when registering for your event. For individual events, they are $15 and for the Auckland Half Marathon Series Grand Slam medal they are $19. The price includes delivery to your door. If you didn’t order one when you registered – but would like to do so now – you can do it via My tiktok up until race week. Just click on the LOGIN button at the top of the web site and follow the prompts from there. Running Events, organisers of the Waterfront Half Marathon welcome walkers in all of our events, irrespective of the distance. Walkers routinely make up around 15-20% of the total field. We take the needs of our walkers seriously and have made changes to how our events operate to allow walkers to be appropriately recognised and accommodated. The notes here will help you, as a walker, to get the most from the event and help familiarise you with our setup for walkers. Even though we are operating inside a full road closure for this event, we cannot guarantee the field of play will be free of all vehicles. Vehicles such as emergency services or our own service or lead vehicles may also be present on the course. Competitors are reminded to keep on the right side of the centre line cones at all times throughout the event. Crossing to the left side of the road means you are cutting the official course and will be disqualified if spotted. Important! The section of Tamaki Drive from Ngapipi Rd to Mechanics Bay and back (km 3 to km 7) is not closed to traffic. Runners will have the use of both lanes on the seaward side of the road – one to head towards the city and one for the return. Again, you must take note of the cones placed down the centre of the running lanes and keep to the right of these at all times. The big kahuna! 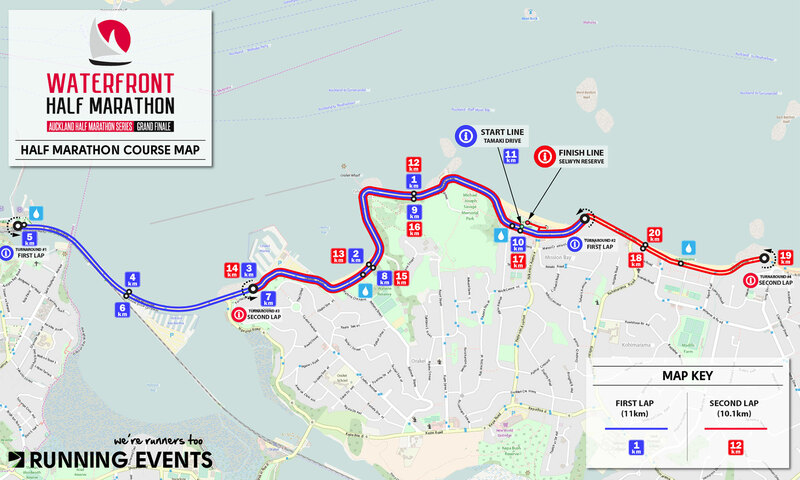 21.1 kilometres of waterfront magic, the half marathon course is two offset laps of stunning Tamaki Drive. The first lap goes from Mission Bay to Mechanics Bay and back. The second lap turns at Ngapipi Rd and heads back as far as St Heliers. Flat, fast and full of action, the 10K course takes you on a single lap littered with entertainment, high fives and good vibes! Mission Bay, Kelly Tarlton’s, Okaku Bay, Kohimarama and St Heliers … it’s got the lot! Just right for the whole family! Feel the excitement of starting under the big arch in Mission Bay. After a quick 500 metres towards the city, turn and head to St Heliers and back. Easy As! Scenic As! Awesome As! Kids, start your engines! Flat and fast, this is high octane action for our juniors as the burn through Mission Bay east and west on their way to a fabulous finish and an awesome finisher medal! Selwyn Domain in the heart of beautiful Mission Bay is the place to be on race day for all the action. Check out the location of all the most important facilities – like toilets, toilets and toilets – so you know where to head on race morning. Fantastically well organised event. I’ve enjoyed all 5 of the series events this season but this was the most superb. Especially loved the entertainment along the way. And thanks for the bus transport option – totally inspired. OMG what a fantastic event honestly would have to be the best half marathon I have done…. such fun the entertainers along the route the volunteers everything. Thank you so much it was a very fitting end to the series you guys outdid yourselves on this one. Best running event I’ve ever been to. From start to finish it was so well done! Great atmosphere, awesome having the big inflatable kilometre markers, the entertainment all over the course was fantastic, enthusiastic marshals, etc. Such a great event. Loved the live tracker which meant the fam could watch my progress from home. The live entertainment along the way was great, all the marshalls were fabulous cheering everyone along. I’ll be back next year.